GMAT or GRE scores at LUMS business school keep inching higher with each passing year. The average score on the GMAT rose 30 points from 2016 to 2017. So what is a perfect score? Does Fulbright give scholarships to MBA Students? Applying for the Fulbright scholarship? Want to do an MBA on Fulbright? Check this. Do Extra-Curricular Activities Matter for Fulbright? Applying for Fulbright? Do extra-curricular activities matter? Learn if they do. Are Manhattan’s 8 GRE Books Worth it? Although not a single compendium, it is a series of 8 books. This format of dividing the GRE into eight different books does justice to the GRE format. Brightlink Prep is conducting a 3-day GRE workshop in collaboration with LUMS, next week. LUMS students & alumni can attend the session and gain a lot of benefit out of it. When I decided to take the GRE I was a bit overwhelmed with the amount of material that was available everywhere. I was pretty confused about how I could work out a preparation plan. Every GRE student measures success differently. For some, it may be a 320/340 on the GRE or finally realizing you aren’t bad at math. For others, it could be to score just enough to pass the GRE test. For us, it is the score that makes you happy! If you really want to improve your GRE verbal score, you must understand these words in context since GRE does not only test words – they test their usage. Georgia Tech uses GRE as one of the important indicators for success in graduate school. Quant scores are highly competitive in engineering programs. Over the past years, I have seen a lot of debate going on regarding the GRE Scoring algorithm and the GRE scoring methodology. These profiles are for the 2018 Fulbright intake and can be used as a yardstick by future Fulbright aspirants. One of the most common complaints I hear from GRE students is that ETS has not shared enough official practice content. But things have now changed! My emphasis in writing this GRE probability tutorial is to help you guys understand the GRE probability concepts that are tested on the exam. Veteran tutors have authored Barron’s 6 GRE Practice Tests and are a helpful practice, but they are not the proverbial ‘Holy Grail’. Should I Study Probability and Combinatorics for GRE? Probability & Combinatorics is difficult because it is not nearly as formulaic as most of the other mathematical topics. In Math, often, there is one way to solve the problem. Are Mocks an Accurate Predictor of GRE scores? Applying to graduate engineering school and preparing for the GRE? Have a look at the Average GRE Scores of admitted applicants at top Programs in US. There are ample benefits of a good GRE score. Some require a GRE score in only admission decisions; others use it in making scholarship decisions as well. How Many Words Should I Learn for GRE? This is perhaps the most important but also the most intimidating part of the GRE verbal section – memorizing a word list. Rote learning a list of unknown words is an extremely boring as well as the most ineffective way to learn new words. Prospective applicants for the Fall admissions have 3-4 months till the application deadlines, most of which are in December and January. If you are aspiring to apply to a US MBA programs, then attending a business school can cost a fortune. So here are MBA Scholarships for International Applicants that can help you fund your MBA. How Many GRE Mock Tests Should I Take? Several students preparing for the GRE ask me about the number of full-length mock tests that they should take to ensure a good score. As expected, the average GRE scores for graduate admissions in top Computer Engineering Programs are very competitive. The only GRE Books you will Ever need! I don’t know the exhaustive list of best GRE books available globally but I once came across at least 27 different publishers and sources of GRE prep. Fulbright applicants are required to upload either a professional resume or a complete curriculum vitae. Applying to graduate civil engineering programs? Have a look at the GRE Scores for Civil Engineering at top Programs in US. How to Overcome Low GPA in your Fulbright Application? Like any application for a graduate program, the USEFP) considers a number of factors when assessing an application for the Fulbright award and GPA is just one of them. A GRE student with a 170 on the quantitative section last week shared that these were 3 of the hardest types of questions you could see on the test. 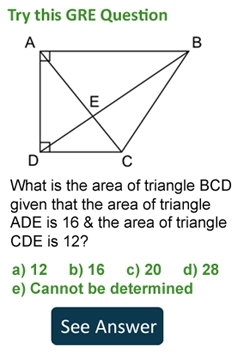 Can you answer these? I have given the answers below and will share solutions once you give these a try. With an admissions rate of only around 15%, even applicants with the most outstanding profiles and GRE test scores get rejected from the Fulbright Scholarship program in Pakistan. To apply to Fulbright program you need to assemble a variety of materials to help the USEFP assess your qualifications. All materials must be submitted with your application by May 17th 2017. The following serves as a preview of what you need to prepare. What’s Easier and Better: GRE or GMAT? The GMAT is required almost exclusively for MBA while the GRE is used for a broad range of other disciplines such as engineering and humanities. GRE or GPA. Which is Important? Verbal section is a natural fear for most non-native English speakers and for those whose cognitive aptitude is inclined more towards mathematical reasoning than language and literature. Brightlink has collaborated with the leading university of Pakistan, NUST, to begin GRE & GMAT prep classes for students in Islamabad & Rawalpindi. It took me a long time and the journey was extremely tough but I finally made it last week – a 327 on the GRE, 169 Quant and 158 on verbal. I write this to share my complete GRE experience: how I prepared for the test, what test strategies I figured out in the process, the role of BrighLink Prep and all the important lessons I learnt during this two and a half month ride. On the 8-10 mock exams he took prior to his GRE exam, his score ranged from 320 to 326 with his quant touching as low as 161 and verbal 159. I was under some pressure when I entered the room but as I talked with them the pressure just evaporated. I personally found Americans to be more decent and easy to talk to. Advice: Just be PASSIONATE. You should be clear on what exactly do you want to do. They want to see that spark in your eyes for whatever career path you are choosing and be VERY realistic about why Pakistan needs it. 1600 students from all over Pakistan applied for the Fulbright program this year in 2016 – a nearly 10% drop compared with those from last year when over 1800 students applied for the USEFP program. Important Advice from 3 Pakistani Students who made it to top US graduate programs on full scholarship. BrightLink Prep’s comprehensive ONLINE GRE & GMAT Preparation Course is intended to help prospective students outside of Lahore to prepare for the GRE & GMAT Exam via LIVE ONLINE Instruction. How many Questions Do I Need to get Right for a Good GRE Score? I got a total of 30 questions correct out of 40 and since the GRE scoring scale is 130-170 then 130+30=160 should have been my final score. Right? Brightlink Prep sat down with 5 Pakistani’s who made it to top programs around the world on Scholarships. The aggregate worth of the scholarships they won was in excess of $1 million. Osama Yaqoob, a GMAT student at Brightlink Prep, who scored a 610 on his GMAT exam recently got accepted by the LUMS MBA program in 2016. He has agreed to share his interview experience and questions below in his own words. Fawad, a graduate of UET Peshawar made it to several US programs for a PhD in Electrical/Computer Engineering for fall 2017. He has gladly shared his profile with us. Brightlink Prep student, Sayaf Iqbal, has achieved the nearly impossible feat of securing a perfect score of 170 on the verbal section of the GRE. The Fulbright application deadline remains the same – the only extension given by the USEFP is regarding the GRE general test. A Pakistani Applicant got accepted with Full-funding to PHD programs in Electrical Engineering to US. Applications were invited for the award of Split Ph.D Scholarships under HEC funded PSDP project – 2 years at SOAS UK and 2 years at QAU. A Pakistani Applicant learned last month that he was accepted to 5 top US graduate programs in Public Policy – UPENN, DUKE, Stanford, Cornell, Texas A&M. What more, he got funding as well. To apply to Fulbright program you need to assemble a variety of materials to help the USEFP assess your qualifications. All materials must be submitted with your application by May 11th 2016. Finally the Fulbright application for the Fall 2017 intake is now open in Pakistan. Apply now by taking your GRE exam and submitting your completed application. I personally think that Fulbright looks at somewhere between 7 to 10 traits in ideal candidates that includes your academic prowess, maturity, and having self-awareness. GMAT was made mandatory for the LUMS MBA program in 2014. LMAT was scrapped in favor of GMAT and the number of applicants declined from 1000 to 600.